The four castles of Beaumaris, Conwy, Caernarfon, Harlech and the attendant fortified towns at Conwy and Caernarfon are the finest examples of late 13th century and early 14th century military architecture in Europe, as demonstrated through their completeness, pristine state, evidence for organized domestic space, and extraordinary repertory of their medieval architectural form. The castles as a stylistically coherent group are a supreme example of medieval military architecture designed and directed by James of St George, King Edward I of England’s chief architect, and the greatest military architect of the age. 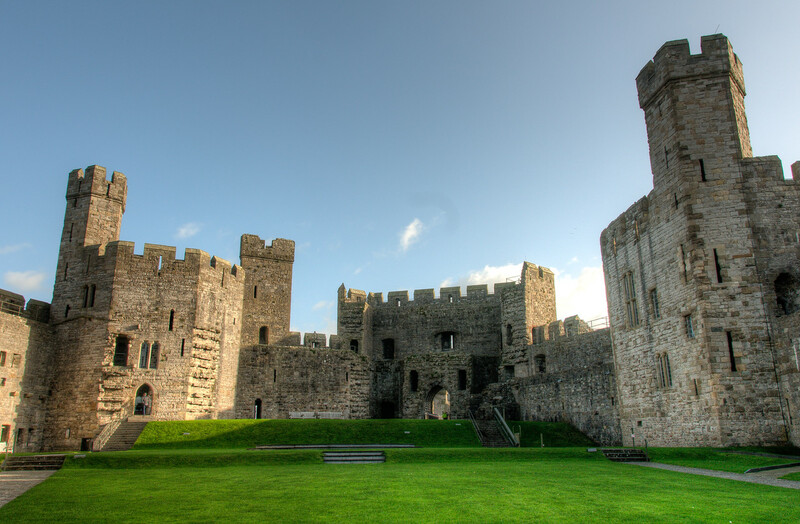 The extensive and detailed contemporary technical, social, and economic documentation of the castles and the survival of adjacent fortified towns at Caernarfon and Conwy makes them one of the major references of medieval history. 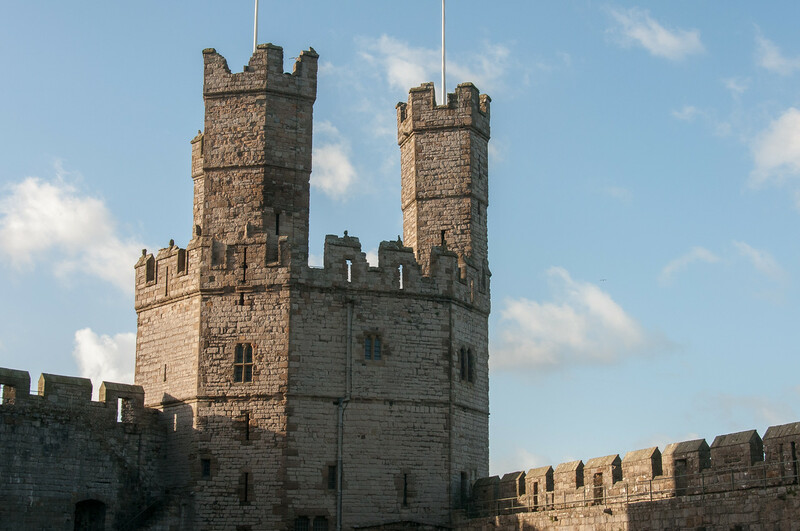 The castles of Beaumaris and Harlech are unique artistic achievements for the way they combine characteristic 13th-century double-wall structures with a central plan, and for the beauty of their proportions and masonry. 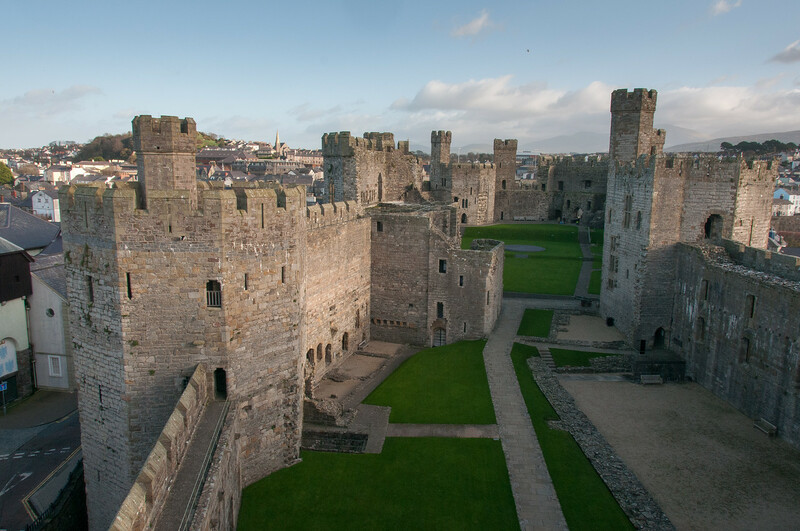 2) Caernarfon Castle is currently the location where the Prince of Wales is crowned. The round platform in the photo is the location of the crowning ceremony. 3) The entirety of the castles was part of the final conquest of Wales by the English. Having difficulty conquering the Welsh, Edward I created a ring of castles in the north of Wales to surround the mountains making it difficult for the Welsh to kick the English out. I found the castles to be perhaps the most interesting attraction in Northern Wales. The Castles and Town Walls of King Edward in Gwynedd is a UNESCO World Heritage Site in Wales. This site consists of four castles and military fortifications dating back from the 13th and 14th century. This cultural site was recognized by UNESCO in 1986. This group of structures is considered as the finest example of military architecture in Europe. They were built and re-built in the 1280s by English King Edward I. This was part of his plan to expand on the domain of his kingdom in northwestern part of Wales. As part of his conquest, he built the “Iron Ring” of castles that make up what is now the UNESCO World Heritage Site. This castle rests upon the Harlech Dome and features a concentric design. It comes with one line of defence that is enclosed by another defensive wall. This serves as the inner and outer ward for Harlech Castle. The entire castle is made out of grey-green sandstone along with large blocks of stone. The latter is used for making towers and used on walls, as well. A stone bridge must be crossed in order to enter this castle’s main entrance. However, this old stone bridge is now replaced with a timber entrance way. This castle was reportedly built for by King Edward I in order to survey the surrounding hills. It also provides an unbeatable view of the nearby sea cliff. Unlike Harlech Castle that is built atop a sea cliff, this one is built on sea level. It was constructed using local Anglesey stone. 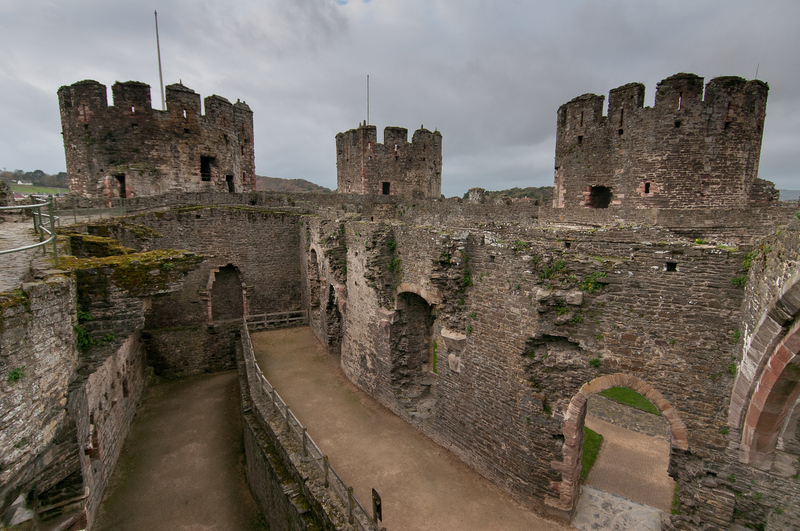 Like the Harlech Castle, it does have an inner and outer ward that surrounds it as well. The castle features a “Gate next to the sea” entrance that is linked to the castle’s tidal dock. This made it possible for supplies to come into the castle directly from the sea. This castle has often been described as the best example of symmetrical concentric planning out of the many castles that were built during Edward I’s reign. In fact, this was one of the best examples of military engineering from this era. The location of Caernarfon Castle makes it difficult to penetrate with some parts of the castle surrounded by the sea. The castle also is comprised of two parts: upper and lower ward. The lower ward contains the royal accommodation while the upper ward is dedicated to the service facilities. The entire castle is surrounded by polygonal towers and defensive firing galleries. There are two entrances to the castle, which are King’s Gate and the Queen’s Gate. Out of all the castles included in the UNESCO site, Castles and Town Walls of King Edward in Gwynedd, this one features the most royal touch. It comes with 8 large towers, private chambers, a great hall, rock fortifications and a massive kitchen fit for the Royals. This castle is built on a rocky coastal ridge and is made of limestone and grey sandstone. In fact, most of the stones used for building this castle was taken from the ridge itself. 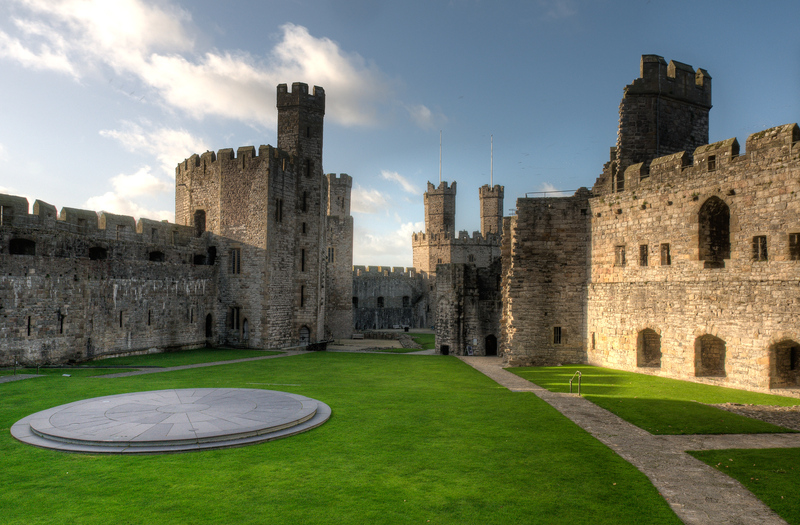 Of the castles listed above, Conwy and Caernarfon are two that have incorporated walled towns to it. These walled towns are characterized by having towers and gatehouses. At the same time, there is a garrison to which soldiers are called upon in order to quell any rebellious activities. Now that this era is over, these sites are collectively recognized by UNESCO as Castles and Town Walls of King Edward in Gwynedd. They reflect the Welsh royal history and has become a symbol of power. Hello, how many people visit this site each year? Thanks. Amazing and good strong walls of this castle with nice green grass. There is helipad also i think between park.